Medai is a Japanese company that has made pumps for as long as any one around here can remember. They have always made one notable pump, the Top Super. The Top Super is imported to the United States by many importer/distributor organizations, and even our mail order competitors. These companies generally have the pump labeled with their own brand name, which sometimes leads people to believe they have their own pump manufacturing capacity. The Top Super has consistently been the most durable and long lasting pump we have sold over a 12 year period. It is the pump we used exclusively for inflating the hundreds of tires used for measurement purposes in our tire section, during that six week period, we had experienced no difficulty or failure with the single Top Super we used. Now about the pump. It uses all steel construction, the base is made of cast steel painted Black, for a foot hold in holding the pump down, it has a steel flip-down stamped steel plate painted Black that is solidly riveted to the base. 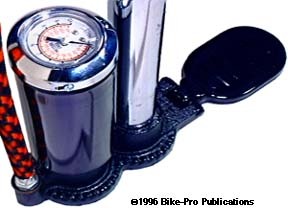 The Top Super is a single action pump so the up stroke merely loads the compression chamber. The compression tube is made of thick steel with a bright nickel plated finish. The compression tube is not easily removable from the base, in part because of a sealing and bonding agent that is both parts common surfaces. The upper cap over the compression made of cast and machined aluminum threading over the top of the tube. The plunger assembly is traditional in nature and simple to disassemble and repair. The plunger shaft is steel rod with a threaded top and bottom. The piston is created using a cupped piece of thick greased leather. This leather piece slides tightly against the inner wall of the compression tube to force air out through the check valve into the reservoir. Screwed into the base near the compression tube is an air tight steel chamber. This chamber is known as a reservoir and holds a volume of the compressed air to assist in equalizing the pressure of the pumps compression chamber and the inner tube. This feature gives the tire a small assist in time as it "seats" on the rim. At the top of this reservoir is a gauge which measures the internal air pressure of the reservoir and the tire. The gauge reads up to 140 PSI or 10 barometric atmospheres. The air hose screws into the base and is the last step in compressed air transmission through the pump. The hose is 22" long with a steel enclosed air chuck. 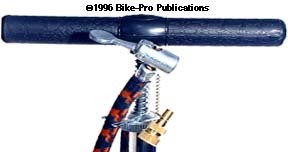 The air chuck, which has a thumb lock, comes from the factory to inflate Schraeder valves, but suspended from a chain hanging off the air chuck is a machined brass Presta to Schraeder adapter, so you can always fill both valve types.